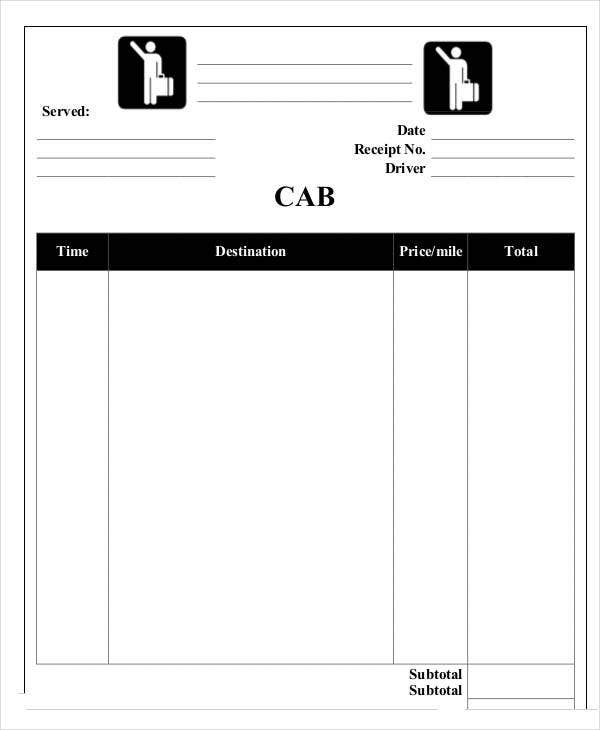 In certain places around the world, taxi drivers will issue receipt samples to passengers hiring their services. This may surprise you, but it is especially useful for people going abroad on business. 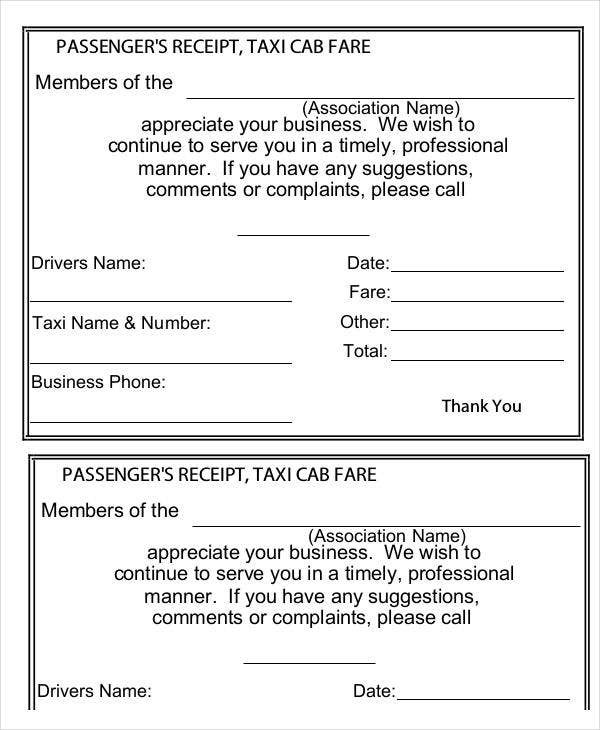 An official receipt issued by the cab driver after the fare is paid will allow an employee’s company to reimburse trips taken for business purposes. In business capitals around the world, from Mumbai to Manila and elsewhere, it is good economic practice for taxi operators to start using taxi receipts. And indeed they are using such receipts. 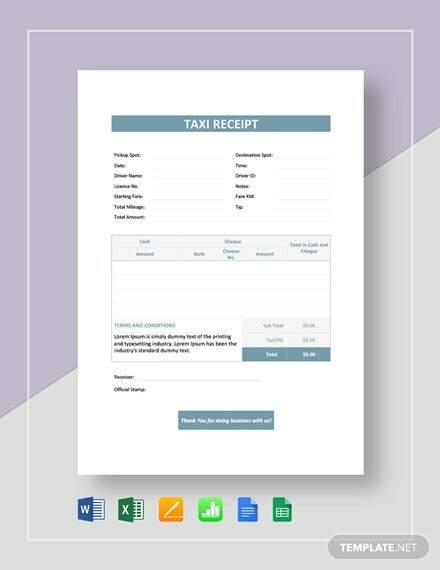 If you find yourself renting out your taxi (or auto-rickshaw) services to foreign business people, check out this list of free Receipt Templates you can download, print, and use right away. 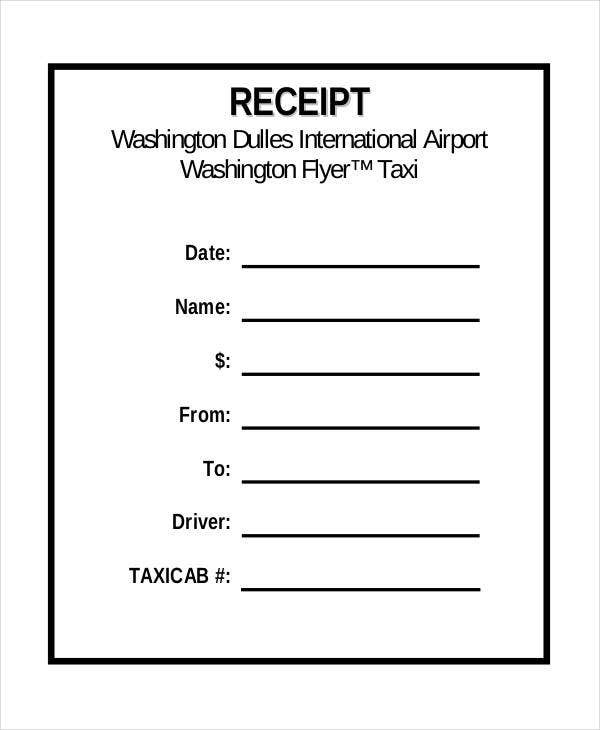 Why Do I Need a Taxi Receipt? A receipt functions as an official bill of sale. This means the receipt documents a legal transaction of a good or service for an agreed amount of money. 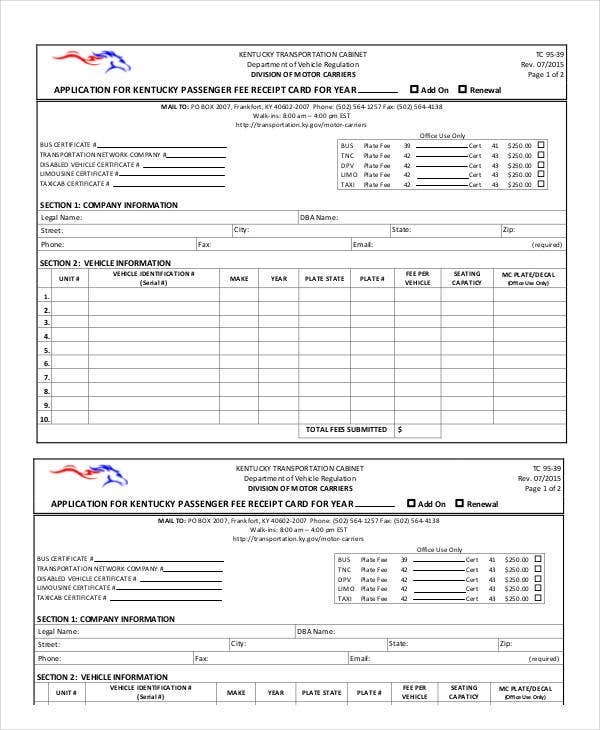 This is useful for legal and tax purposes, especially if the local transportation agency requires this of all registered taxi operators. And for the foreign businessman, it is necessary for travel reimbursement. But not all taxis provide receipts, nor are they required to. They might merely use a meter or a standard service rate decided locally. When Will I Need a Taxi Receipt? There are situations and business styles that will require using a service receipt. Private transportation companies. There are hire-a-driver services where every transaction will feature a receipt that lists the time and date, the mileage, and the cost. Both driver and passenger will keep copies of this receipt. Public prepaid taxi services. If you are running a prepaid taxi service operation and have booths at airports and railway stations, using receipt templates is a legal requirement. Private or personal transportation services. 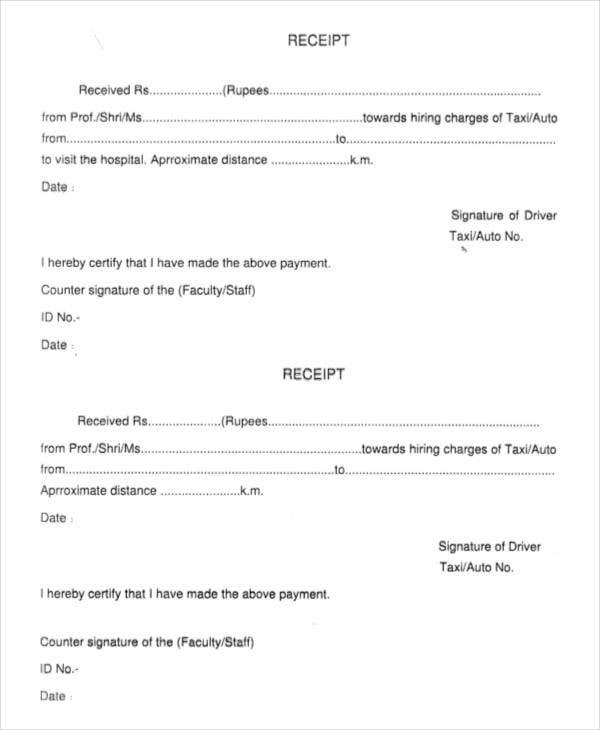 If you are renting out transportation or carpool services from your personal owned car, you would definitely need some form of these taxi receipts to ensure legal and organized transactions. Any good Blank Receipt Template can also work for you, when modified to accommodate the right details. Note that taxi service can be rendered by any vehicle that’s not a taxi cab. If your transport agency uses vans, motorbikes, or even auto-rickshaws, this practice applies to you. If you aren’t already using a receipt of some kind, that needs to change. These free samples can get you started with hardly effort on your part. 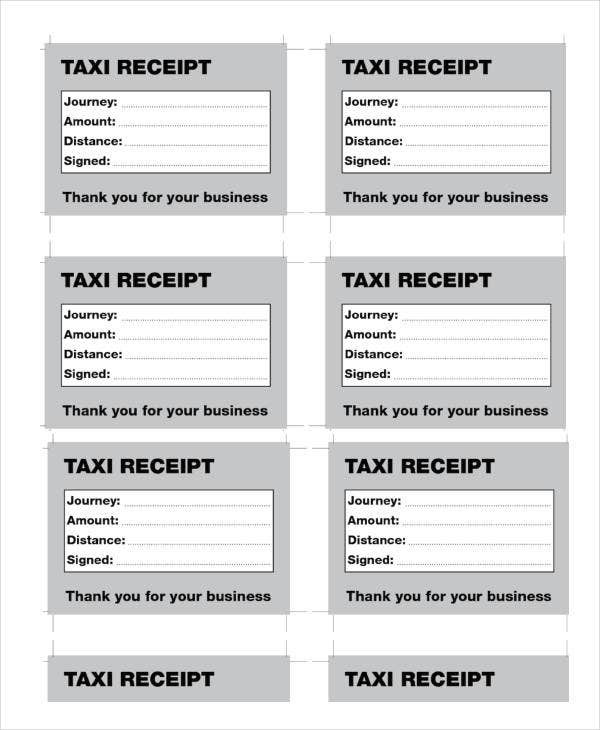 How Do I Use a Taxi Receipt? Every sample on this list will serve as official service receipts. Just choose one that fits your taxi business model. Download them for free and have these readily printed out before your first drivers hit the road.